I had no idea there was something called the Potsdam geoid – a.k.a. the "gravity potato" – let alone news about it. It has been revealed that the terrestrial gravity that the potato (IMAGE ABOVE) represents changes with time. 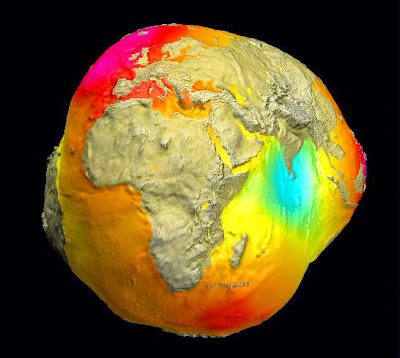 The model, based on ground-based and satellite measurements compiled by the GFZ German Research Centre for Geosciences, now includes seasonal fluctuations of water balance on the continents and climate-related variations including melting and growing ice masses. German researcher Frank Flechtner explains, "This allows the measurement of gravity in inaccessible regions with unprecedented accuracy, for example in Central Africa and the Himalayas."